The marketing industry is broken. Consumers are tired of interruption, push, mass media and the manipulation of marketing and advertising generally. They want to deal with honest, ethical companies that have heart and purpose and that care about serving all their stakeholders instead of their pockets. Conscious Marketing proves that marketing can really work if the paradigm is shifted--radically. 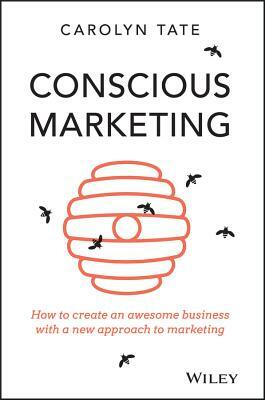 In Conscious Marketing: How to Create an Awesome Business With a New Approach to Marketing, author Carolyn Tate demonstrates just how beneficial this shift can be. By practising the four tenets of conscious marketing, companies can raise their brand's profile and attract customers for life. The book shows how building a business with a higher-purpose can lead to sustainability, profitability and industry leadership. Conscious marketing works for both multinational corporations and cash-strapped small business alike. The book includes a three-part guide to crafting an actionable plan, including where to find help. Marketing doesn't have to be the budgetary dead weight it has become. It can be fun, human and inspiring for everyone involved, but change requires a deep shift in thinking and behaviour that goes way beyond the transaction or the sale. To stay relevant in the modern economy, businesses must show what's at their core, why they do what they do and why it matters. Conscious Marketing is a comprehensive guide to fixing the problem, with a sustainable solution. CAROLYN TATE is a speaker and educator and the founder of The Slow School of Business, a school dedicated to helping companies build purpose-driven and prosperous businesses that make the world a better place. Carolyn is also the author of Small Business Big Brand, Marketing Your Small Business For Dummies and Unstuck in Provence. Visit slowschool.com.au or carolyntate.co.